Take this tab for example, it is specifically required that there should be no release sound after bending. I tried many ways but just cant get rid of the release sound. My first attempt was to mute the release with my right hand or finger, but it definitely breaks the continuity between the notes (because it is equivalent to add rest between notes), and hard to do that when it requires very fast tempo. What should be (a) proper way(s) to mute the unwanted release sound from bending? The usual tactic is to mute with either a handy spare finger on the left hand, or with one on your right hand if you have to. For this example, when you have played that first note and bent it up, don't release your finger completely. As you start your next note, just release this one off the fret, but keep your finger holding it to damp the note. Then release the bend while keeping the finger on to damp any vibration. If the noise that bothers you is due to open string noise upon release some shredders place a "scrunchy" or thick rubber band around the neck by the head (first fret). This is also somewhat necessary for two handed tappers and some string skipping type licks. But in my opinion the use of that technique is somewhat of a cop out to practicing proper muting as mentioned by Doktor Mayhem in the other answer. With practice you learn to place combinations of fingers down at once to get the note and tone you want and muting of the other strings. It's not a matter of just placing your hand over all the strings. On classical guitar when playing fast scale runs if I am going to hit a note that resonates with an open string I automatically touch the open string with a free finger. It took time to train myself to do that but it doesn't slow me down. You should also consider playing with your effects if you are using any. You set up may be too hot, have too much delay, etc. That may cause the release sound you mention to be amplified more than necessary. Not the answer you're looking for? Browse other questions tagged guitar electric-guitar technique note-bending or ask your own question. How to bend and release without flicking the other strings? Are low key harmonicas harder to bend? 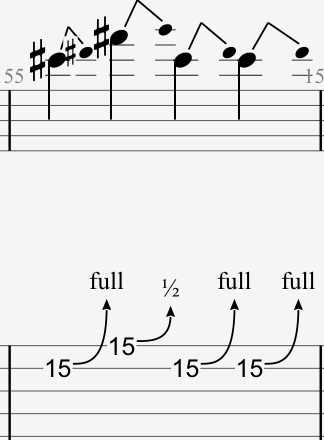 Fret hand muting for a less messy, more “single note” sound? How to make good palm mute distortion sound? How do you bend notes on the bagpipes? Is there a “virtual guitar” app that can bend strings?